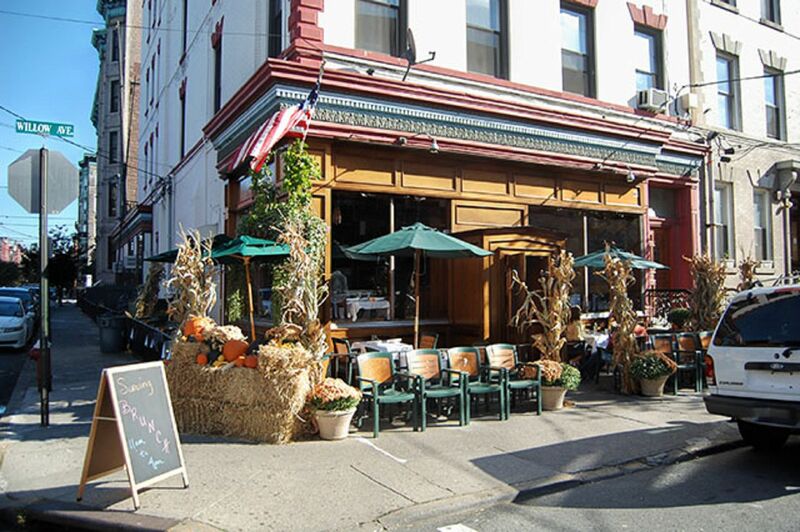 Some bars in Hoboken might not be historic or have been in existence for generations but still have an established reputation that makes you feel like it’s been there forever. 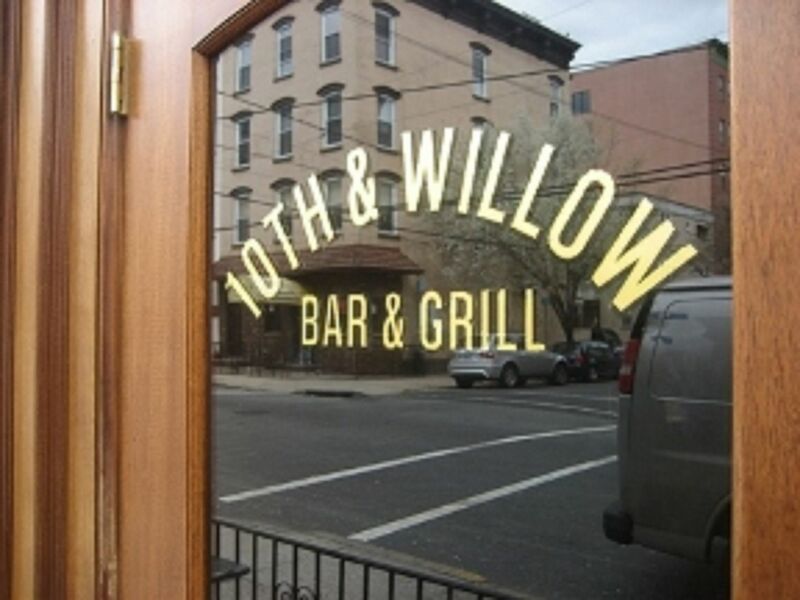 10th and Willow, surprisingly located on the corner of 10th Street and Willow Avenue has been in Hoboken for 13 years and helped welcome the arrival of the latest wave of Hoboken gentrification just prior to the turn of the century. 10th and Willow is one of those rare bars that isn’t on Washington Street nor near the PATH that many out of towners have either been to or know about. I walked in with my date on a Monday night with one specific goal in mind…their wings. 10th and Willow thankfully lists their weekly specials on their website so you can pick a night that has a deal that you can exploit the most. Most week days offer half price of something, whether it’s appetizers, martinis or entrees, but on Monday night its all you can eat wings for $5. We got to 10th and Willow fairly early (about 6:30ish) on a Monday night, well in advance of the Monday Night Football game. At first there was a bit of confusion as it was our first time going to “wing night” and we didn’t know that certain seats are reserved for those civilized people that would be actually ordering food, versus the plebs that were going to be getting messy with the wings. After that was all figured out we took a seat at one of their communal tables in the bar room. Apparently, it’s first come first sit at the tables on wing night, and if you have ever tried to eat wings while holding your plate you know how important having a table is. So take note of that, get there on the early side, and ensure a seat. 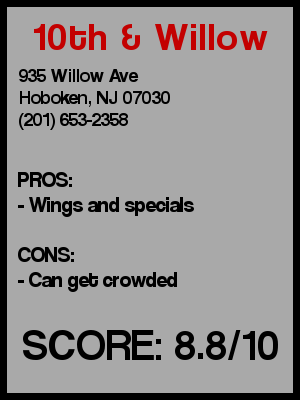 The tables are communal so you definitely have the opportunity to make friends although with disgusting hands and a face full of wing sauce and a plate for of bones I can’t exactly say it’s a great time to pick someone up. Although that being said there were a good amount of women out considering it was a football night, and a food special that was ripe for pigging out. The beer list at 10th and Willow is fairly diverse and I ended up picking the Magic Hat #9 on draught for my drink of the evening. My date had a few vodka sodas which she finished quite quickly. They also have a pretty creative list of martinis and mixed drinks. While martinis are not my thing, I did have their alcoholic lemonade drink in the past. I purposely skipped over some of the more girlie drinks, but didn’t realize that the lemonade they used was in fact pink lemonade making me look pretty effeminate. Luckily I learned from that mistake and was going with just beer and wings this time. Preconceived notion –It’s possible that I’ve been here more than any other place, but I never went on a Monday night before. I didn’t expect it to get as crowded as it did. 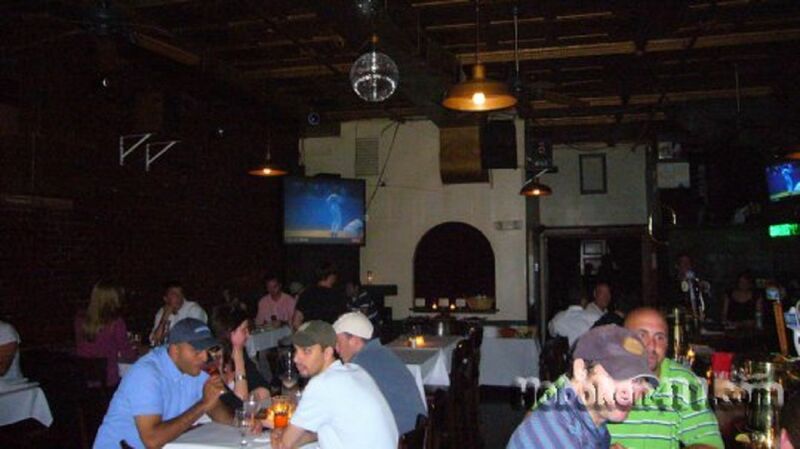 The front bar room was definitely packed, a good sign for any bar. Crowd stereotype – Surprisingly pretty varied. Men, women, even a family with a baby earlier in the night. Date – Not on wing night…no one looks good eating wings. But on all other nights this is a great place to grab a drink and a good dinner. Hookup – Pretty good chance. Dance – You’ve got a decent chance. Overall – 10th and Willow is the perfect place for almost everything. You can hang with a friend, try and hookup, bring a date out to a nice dinner all in one place (probably not all the same time night though). Most of the times I’ve gone is either during the summer to enjoy the outdoor seating or for dinner on a weekend. This was my first wing night and it won’t be my last. Remember to get there early enough to get a seat and enjoy a great Monday night…not many more Monday night football games left! (although I think their special goes all year long) I’ll give it an 8.8.